1. I know, it's not Thursday, but there are a lot of thoughts this week. So today is going to have some of them. The not-so-happy ones. The ones that make me think the universe is trying to tell me something. Or simply drive me crazy. 2. Let's start with a small annoyance. My lunch turkey. Giant Eagle Market District House Roasted Turkey. 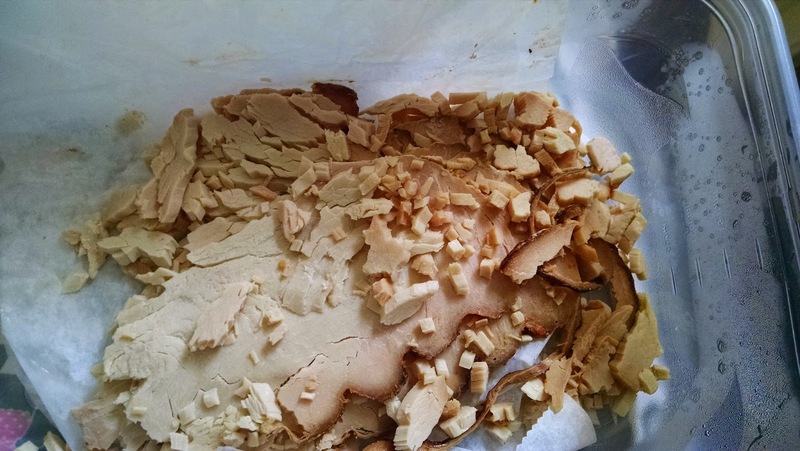 It's supposed to be slices of in house roasted turkey. Instead it's crumbles of roasted turkey. Do you have any idea how difficult it is to make a sandwich with those wee crumbles? Or to eat a sandwich of wee crumbles? Let's just say the dustbuster is working overtime this week. Thanks, Market District, for selling lunch meat that crumbles when you touch it. 3. While I'm thanking companies, let me thank Cinemark for NOT sending Tuesday's correct movie times to the Tuesday newspaper. We've been trying to find time to see Guardians of the Galaxy and we finally decided to make the time and go last night. Dinner was super quick and easy. SP was home by 7 pm. I checked the movie times in the newspaper yesterday morning when I read the paper and confirmed that it was at 8:45 pm, just like it has been for 2+ weeks. Except that when we got to the theater, we discovered it wasn't. There were no evening showings of that particular movie because there was a special event. A special event that wasn't listed in the newspaper. 4. So we went to Lowe's to return the ceiling fan/light remote. My office ceiling fan/light has not worked for 2+ years. I've been managing with 2 lamps, but they really do not offer enough light when it's dark outside. Evening darkness is coming earlier & earlier. So I made it quite clear we need to remedy this situation. We assumed the problem was the existing remote and transmitter because 2 years ago when we popped a new battery in, nothing responded. So we finally bought a new remote. But SP says he needs to completely remove the ceiling fan to locate the old transmitter and put in the new one. Removing the huge ceiling fan isn't something he can do by himself, and I cannot help. So last Sunday, after determining that any fan removal would require assistance, we again tried a new battery in the old, existing remote. Maybe it just needed a good long rest? The fan will now operate, but the light won't. Changing the light bulbs didn't help either. So now we think it's not the remote. It must be the light part. So we returned the remote we bought last weekend and looked at new ceiling lights. However, when we painted 6 years ago, we didn't completely remove the ceiling fan, so there's some question of the size of the hole in the ceiling and the area of 6 year old paint and the area of older than 6 years paint on the ceiling - we really do not want to re-paint the ceiling. And I won't be happy if I see the old paint next to our paint. We spent quite some time in Lowe's trying to find a light that we liked that would completely cover any potential paint mess and sit flush against the ceiling to hide any ceiling mess. Stay tuned for more on this exciting project. Lesson Relearned: Nothing is ever an easy fix in this house. 5. After Lowe's we returned home and watched another episode of Sherlock Holmes and then it was bed time. I was in the bathroom, getting ready for bed, when I was attacked by a MONSTROUS MAN-EATING spider. It popped out of the vent and sat on the bathroom floor, between me on the toilet and the closed door offering escape. I was trapped. I was terrified to turn my back on it and scoot onto the wheelchair and terrified I'd run it over with the wheelchair while trying to escape and then have gross spider guts on my wheelchair. So I did what any sensible girl would do. I screamed so loud for my husband that he thought I fell again and broke another bone. I screamed his name over and over until I heard him pounding up the stairs and then I started screaming for him to kill the monster. He agreed it was large for a wolf spider. Who knows what it had been feasting on but it was HUGE. He got a shoe and smushed it, thus saving me from the monster. And then I made him use a Clorox wipe to clean the floor so that there wouldn't be any disgusting spider gut residue. 6. It's only fitting that I be attacked by a giant spider just hours after seeing the first stink bug on the kitchen window. Yup. Must be time for the little stinky monsters to wiggle their way inside for the winter. Time to douse the kitchen windows with stink bug killing bug spray. 7. 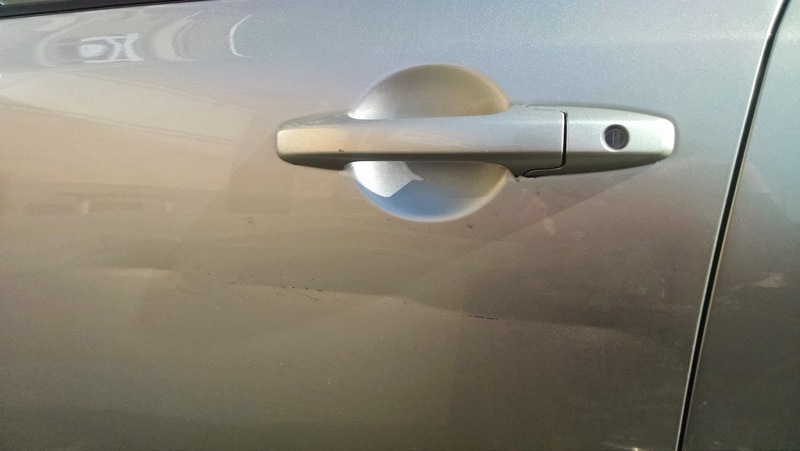 Last weekend, we were exiting a store in Robinson and as I looked out at the huge parking lot for our car, my eyes were caught by a car with the driver door smushed in. It looked awful in the bright sunlight. Who on earth would have that kind of awful bashed in door from an accident and not fix it and... OH EFF THAT'S US WHAT THE EFFFFFFFF??????? Sometime in the last week, someone, something, smushed the driver door. We have no idea what. Or who, because the jerk didn't leave a note. I took some photos with my phone and this week I emailed them to my brother. My brother was a material science engineer who did internships at a steel mill roll manufacturer and at a steel company and then after graduating was hired to work at Honda. We have a Honda. He knows about Hondas - and about car metal and car doors and car bodies. His opinion: some jerk ran a bicycle handle bar into the car. They creased the door with quite some force and scratched the paint as well. And, did I mention, DIDN'T LEAVE A NOTE. We have no idea where we have been in the last week that a bicycle could've hit the car. We live in the suburbs and go to places like Costco and Walmart, with huge parking lots and no bicycles around. He parks in a garage at work. In a garage at home. I'm thinking maybe it was actually a shopping cart, but seriously, who forces a shopping cart between cars with such force that it creases metal and scratches paint??? So we're getting some quotes on repairing it. The car is only 4 years old, and we have been hoping to keep our Honda for 10 years like we did with the last one. We're just annoyed that someone was so stupid and rude and now the repair cost is on us because they didn't leave a note because THEY ARE A JERK. 8. Did I mention the car needed $500 of 'routine maintenance' to pass inspection last month? Yeah. So really not happy with additional expense on the car. 9. Not to mention the likely extra expense of renting a car while ours is fixed. We have only one car because only one of us drives. I no longer drive because I do not feel safe driving given my health issues. 10. Our car luck this year? Not good. Not only ours, but remember me writing about getting rear ended in OR while sitting at a red light? Yes, the insurance for the guy who hit us is covering the entire cost to the car rental company, but we got a copy of the bill, and it was a little over $2,000 for the car repair and then another $1,000 in fees from towing, rental replacement, lost rental income, etc. Yikes! 11. On the bright side, we have finally decided on a tree company to remove the dead trees and overgrown trees (7 trees being removed and 5-6 pruned). And we lined up the guy to clean and seal our deck since it has been 2 years. But between the car and trees and deck and ceiling light... thousands of dollars are flying out of the bank account. Kind of stressful. 12. Oh and lucky us - the niece who just turned 4 and lives in the east is having a birthday party this weekend and the Squirrel Hill Tunnels outbound (going east) are going to be closed this weekend. According to the news, the last tunnel closure resulted in delays of up to 2 hours. The detours are through/around Squirrel Hill and Oakland area, where all the Pitt students will be moving into their dorms this weekend. Oh joy! There are some steps we can take to get where we need to go and not be on the parkway, but at a certain point, I'm not sure how much they'll really help given where the detour takes you and the fact that college students are returning this weekend.